Bowling: Shannon Gabriel 0/26 in 9 overs, Jason Holder 5/41 in 14.2 overs, Kemar Roach 1/33 in 10 overs. Play resumed on Day 4 as Dilruwan Perera and Kusal Mendis came out to bat and Jason Holder started it off for West Indies. With 63 runs needed and 5 wickets in hand, Sri Lanka were clearly on top but Holder struck in the very first over to get rid of Kusal Mendis. Kusal Perera, who got injured yesterday came out to bat. Both Mendis and Perera began to counter attack against a strong bowling attack. 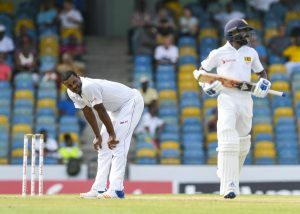 Even Gabriel who collected 13 wickets in the previous test, couldn’t get a wicket as the pair led Sri Lanka to victory. 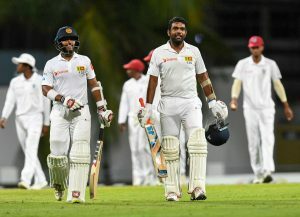 Fans and avid cricket followers were on the moon after Sri Lanka won this test and successfully drew the series by 1 – 1. Sri Lanka, in their last four overseas tours, have won clean swept Pakistan, lost 0-1 in India (2 draws), won in Bangladesh, and drawn in West Indies. Several key players have not played. Well played the two Perera’s! Kusal for braving the possible injuries and pain he had and Dilruwan for standing tall and doing what he did. Congratulations for @OfficialSLC for an outstanding win to level the series and the 1st ever by an Asian team at Bridgetown Barbados. A big well done to the team, the bowlers in the 2nd innings and of course the 2 Perera’s this morning. Kusal Perera had to leave in an ambulance yesterday. He came back to seal it. This is the end of this test series of West Indies Vs Sri Lanka. Keep visiting Allsportspk for more cricketing updates.